I am a Harry Potter nerd. I own all the original hardcover editions of the books and most of the films in the Harry Potter series on DVD, and yes, I have watched the behind-the-scenes extras. I think that just makes me someone who was a kid in 1998 when the books came out, but Matt likes to call me a super fan. I will admit though, that I did unabashedly geek out for all things Harry Potter on our recent trip to London. Hints of witchcraft and wizardry abounded through the streets of London, from the old cobbled streets, to the quaint street shops. Even just the sound of the British accents had me whispering Hufflepuff and Whomping Willows in response. That’s why I could not pass up the opportunity to visit the Warner Bros. Harry Potter Studio tour, and experience the making of Harry Potter for myself. 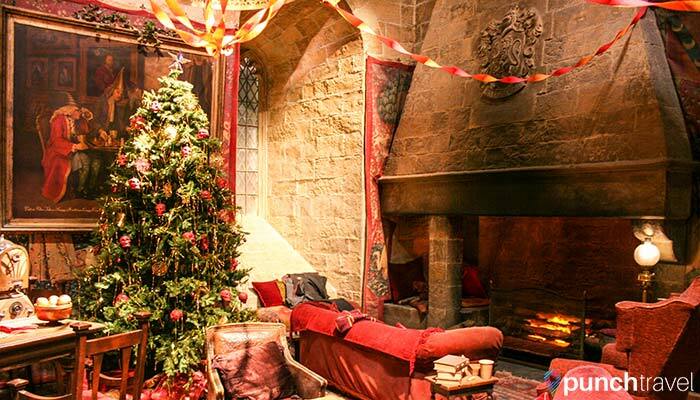 The Gryffindor common room, with the painting of the Fat Lady nearby. We booked our tickets online and had no trouble obtaining tickets for a weekday in January for 35 pounds each. Tickets are timed, so we purchased the first available time slot, for 10:00am. The train departs regularly from Euston Station in London and takes about 20 minutes to get up to Watford Junction station. From the station, a free shuttle bus took us Muggles (that’s non-magical people, to those of you who are not in the know) to Warner Bros. Studio in Leavesden, another 20 minute journey. 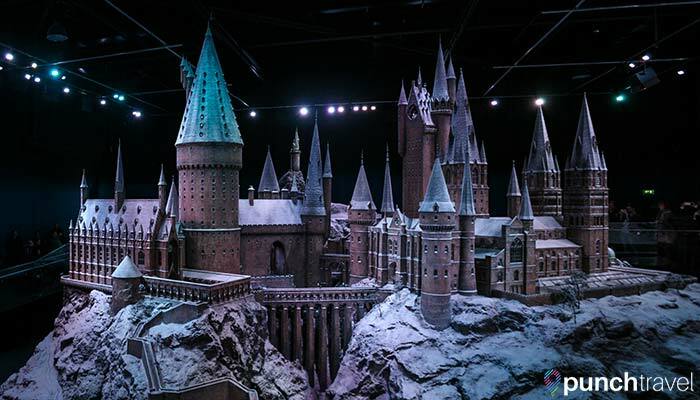 Housed in the actual Warner Bros. studio where the movies were made, the tour is mostly a self-guided tour and can take anywhere between 2 hours to the entire day. There were a wide range of visitors there on the day we visited, everywhere from families with young children, to several couples like us who had clearly grown up with a love for the books and films. The tour begins in a holding room that is decorated with posters for the films’ releases in different countries and different languages. We then entered a theater where we watched a short introductory film hosted by the three young stars. Upon the conclusion of the film, we were ushered to the grand entrance for the actual tour. The theater opens into the Great Hall, the room in Hogwarts Castle where all of the meals took place. The hall was still set for Christmas, with holiday decorations and snow falling from the ceiling. The tour begins in the Great Hall, which is decorated for Christmas during the winter, complete with falling snowflakes. 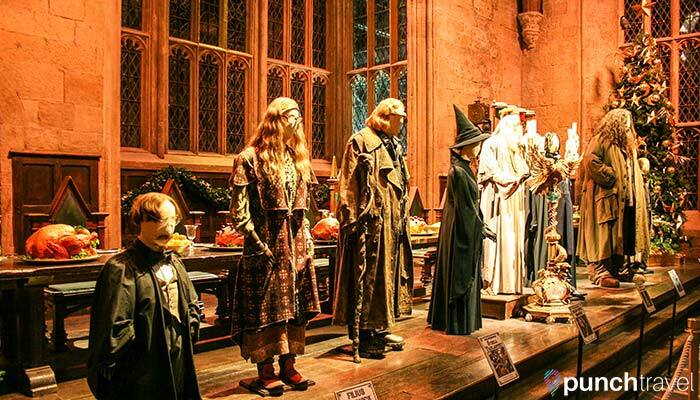 Lined up at the front of the Great Hall are the costumes for each of the professors. The tour continues with an introduction to the directors and producers who have worked on the movies and then takes you through various sets, props and costumes. 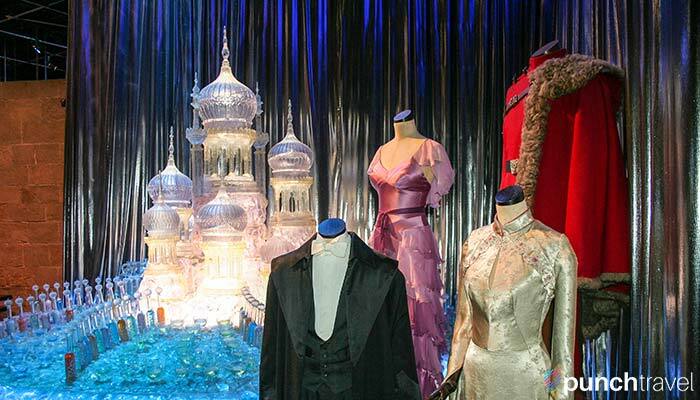 There were thousands of items on display, and each one extremely intricate and detailed. It was truly impressive to realize the incredible craftsmanship and the amount of time, effort and money that was involved in making these films. 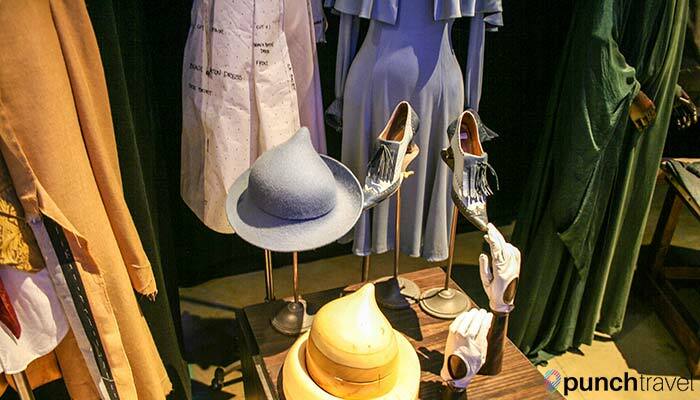 Fleur Delacour’s costume – tres chic! 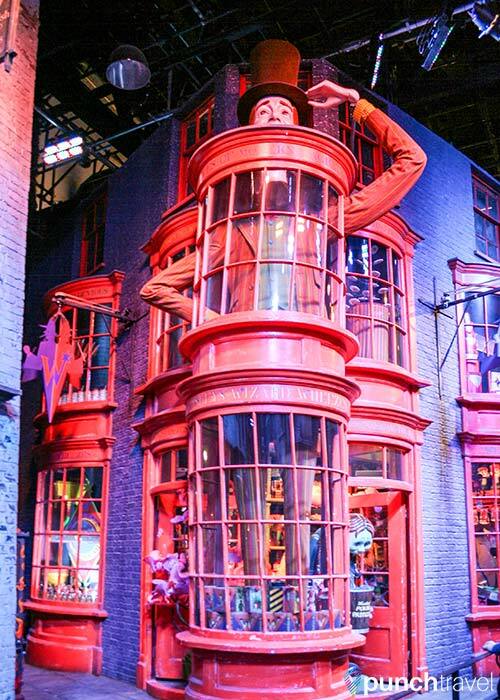 The Weasley home was just as it was in the movie. In the foreground a knife chops carrots and a spoon stirs a bowl. On the left is the Weasley family clock which shows where each member of the family is. 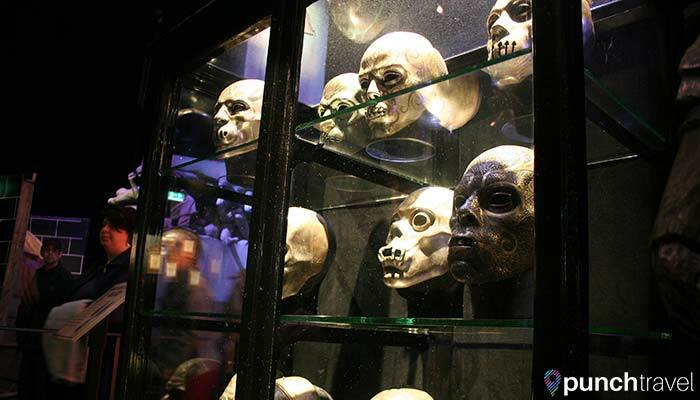 Masks worn by the Death Eaters. The next section of the tour is of King’s Cross Station, complete with a section of the Hogwart’s Express. There are plenty of photo opportunities available, including the iconic Platform 9 ¾. 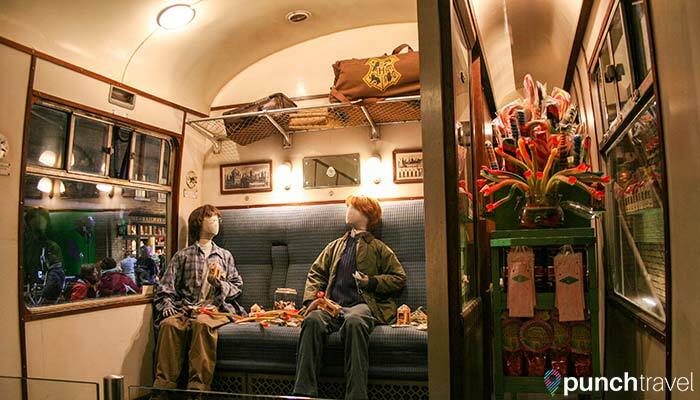 The Hogwarts Express has played an important role in all of the films, and in each train car you can view memorable train scenes from each of the movies, like when Harry and Ron first met. After this area we had a brief respite in the cafe. 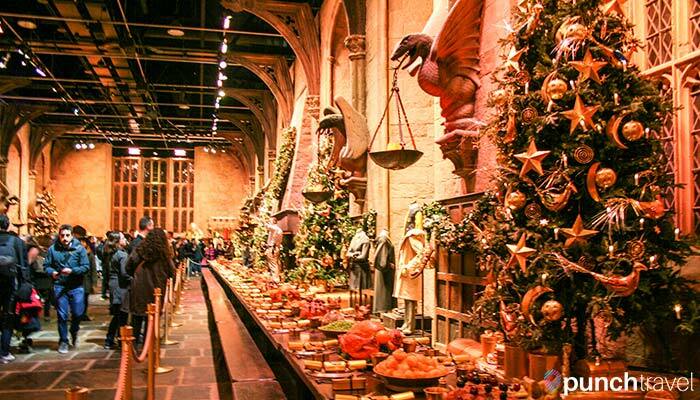 The restaurant serves typical cafeteria fare, like burgers and sandwiches, and of course Butterbeer, which is sold in souvenir steins or as ice cream. 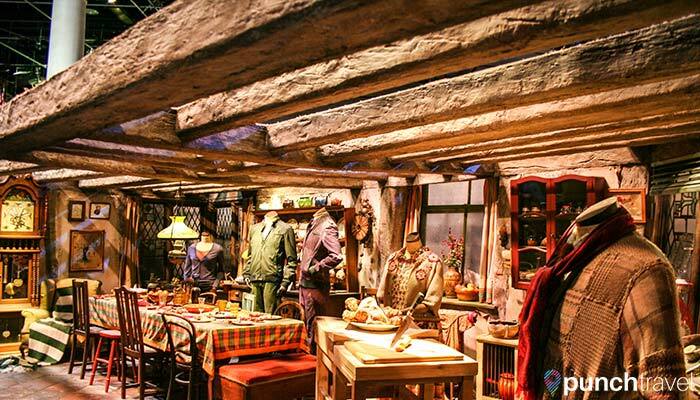 The dining area continues into the outdoor set area, which houses some of the larger set pieces, like the Knightbus and Harry’s childhood home that was destroyed by Voldermort, as well as the Ford Anglia that Harry and Ron first travel to Hogwarts in, and Hagrid’s motorcycle. 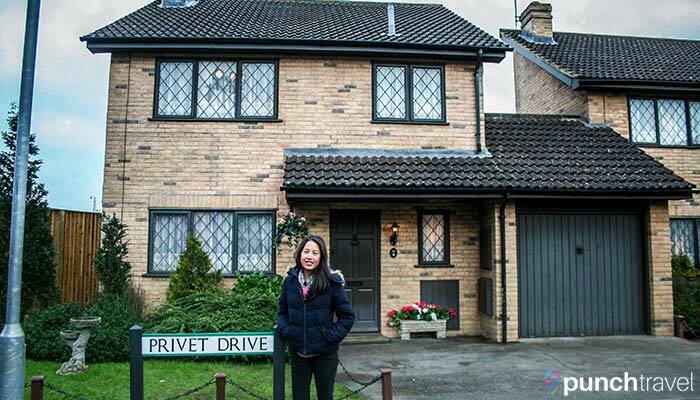 Stopping by the Dursley’s house at 4 Privet Drive. Think anyone’s home? 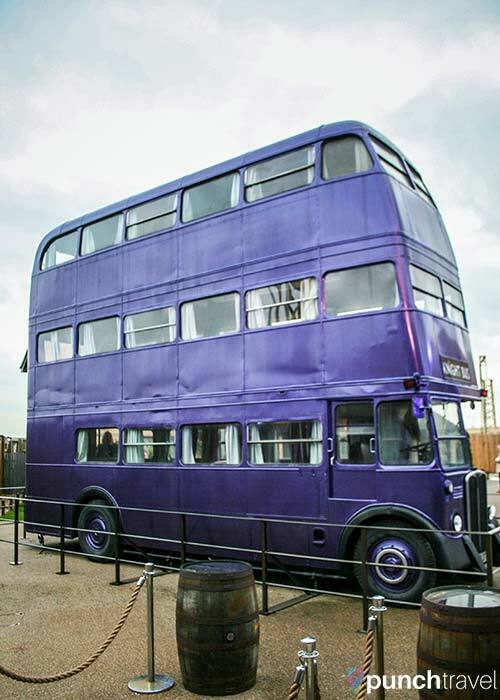 The Knightbus in all its glory. While you can’t actually board the bus, you can take a peak inside and see the cots laid out inside, as well as the shrunken head hanging from the rear view mirror. 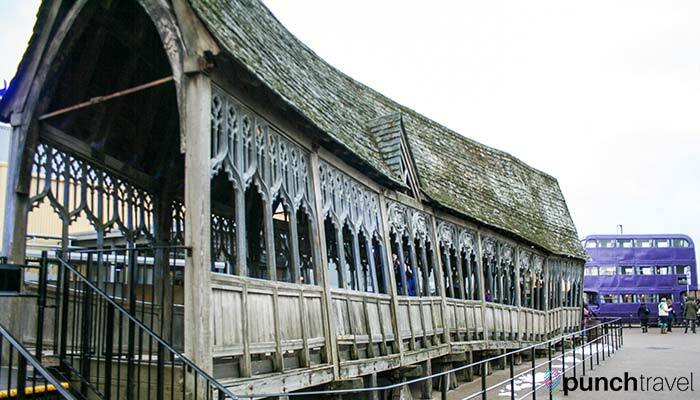 We walked through the Wooden Bridge, from Hogwarts Castle. 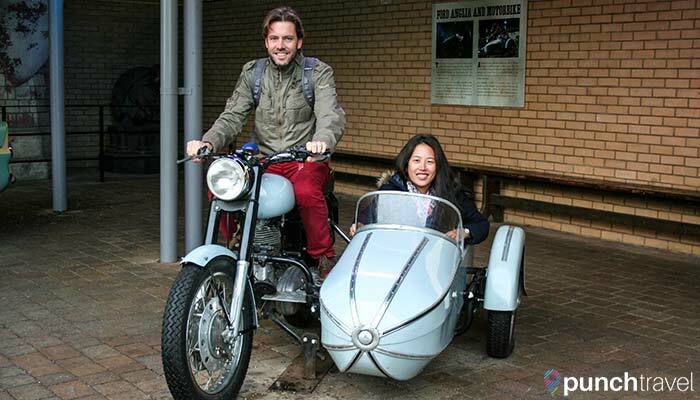 Hamming it up in Hagrid’s motorcycle. Back inside, the tour continues with a look into the special effects, both mechanical and computerized. A film like the Harry Potter films obviously used many different effects and a lot of the secrets to how different scenes and characters are made are revealed. I won’t divulge them here, but I will say that I was surprised by a lot of what I saw! 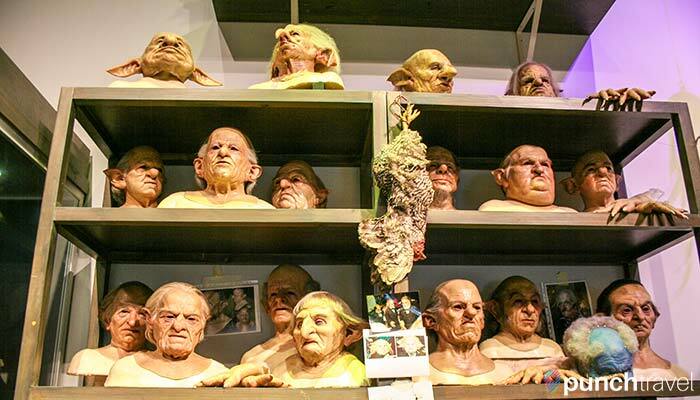 Many masks and wigs were used in the movies, and these goblin masks were some of the most detailed and unique ones. 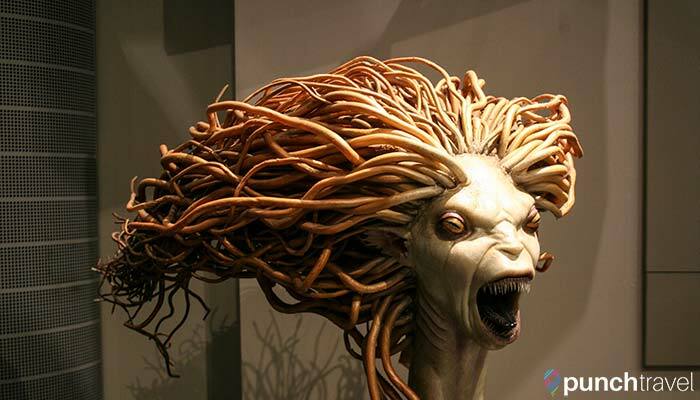 A model of the mermaid head from Harry Potter and the Goblet of Fire. One of the final stages of the tour was a walk through Diagon Alley. 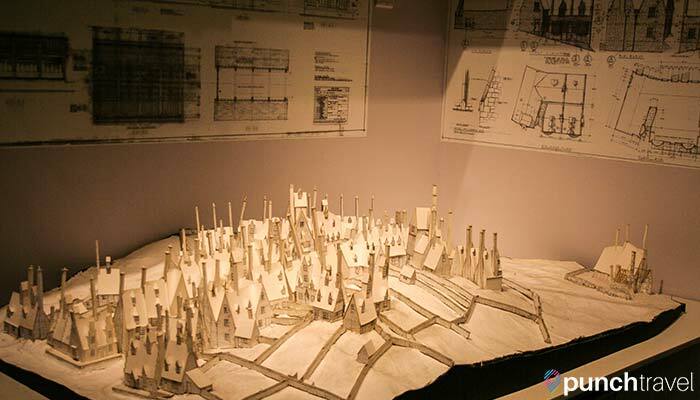 The final area displayed all of the models and sketches they used to put together the films, including drawing boards, costume sketches, and wooden models of different sets and buildings. 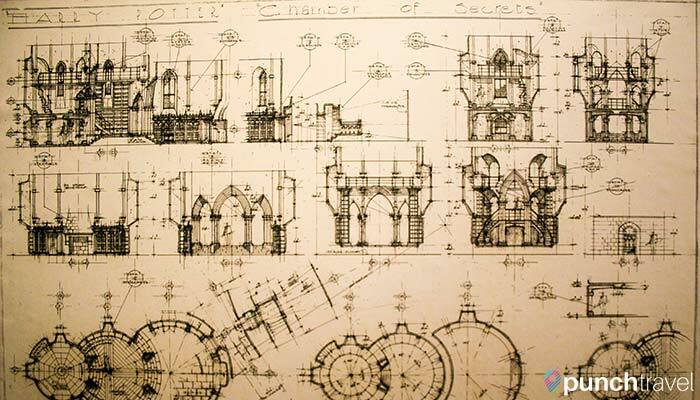 One of the many sketches used to build the Harry Potter film sets and models. A paper model of the town of Hogsmeade. Arguably the most impressive thing I saw on the entire tour was the replica model of Hogwarts Castle and grounds. Painstakingly detailed and majestic, the model is used to film the sweeping exterior shots that you see in the movies. It is on display in a large room, and you can walk all around the model and view it with different lighting to mimic daytime and nighttime. The culminating attraction was a stunning model of the entire Hogwarts castle and grounds. Not much can top that, so it was no surprise that we had reached the end of the tour. I spent an equally inordinate amount of time in the gift shop analyzing several souvenir options, and settled on a keychain and a notebook. For those of you who may have visited The Wizarding World of Harry Potter at Universal Studios, a lot of the souvenirs are the same, but there are several things that are specific to the Warner Bros. Studio Tour. All in all, we spent the entire day (about 6 hours) at the Warner Bros. Harry Potter Studio Tour, and it was worth every minute. I examined every prop, scrutinized every set and pondered every placard, eager to soak in every bit of the magic of the Harry Potter films. You may be able to pass through the tour more quickly than I did but I know that for me, I wanted to cling to this fond nostalgic memory for as long as I could. The tour moves you along in one direction, but you can spend as long as you want in each section. Guides are stationed throughout the tour to provide a closer look into some of the movie magic, like how they made Harry’s footsteps in the snow when he was wearing the invisibility cloak, or what is really inside Snape’s potion jars. Eating is only permitted in the two designated dining areas, one located before you enter the tour and the second about half-way through the tour. There is food for sale but you are also welcome to bring your own food. Part of the displays are outside, so be prepared for any weather condition.